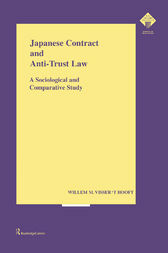 Little has been written on Japanese contract law and anti-trust law in Western languages. This book describes the role of this law in protecting the distributor against unilateral terminations of distribution agreements. There have been significant pressures both to lower prices and restructure distribution channels in Japan which have strained many distribution agreements. This volume, based primarily on Japanese language legal material, not only involves a study of applicable black-letter law, but also a sociological study of its application in practice. Detailed analysis has been made in particular of famous legal termination cases during the 1990s in the Japanese luxury cosmetics distribution system which generated influential decisions by the higher courts and the Fair Trade Commission, providing new insights into whether or not there are distinct Japanese attitudes towards contracts. Willem Visser t'Hooft specializes in Japanese law, and has been affiliated with the University of Tokyo and the University of Leiden. Dr t'Hooft lectures widely on Japanese law throughout the Dutch academic community.